P&O Cruises has been perfecting the art of cruising for over 175 years and is known as "Britain's favourite cruise line". The P&O fleet consists of 7 ships, that vary in size and cater for different types of guests. The newest ship in the fleet, Britannia and the sister-ships, Ventura and Azura, are the family friendly ships, together with the Malta-based Oceana. On the other hand, the mid-sized ships Aurora, Arcadia and Oriana are exclusively for adults. 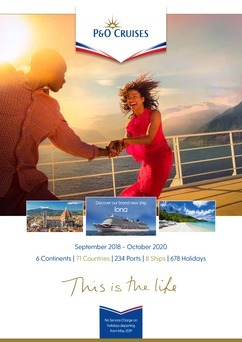 2020 will see the launch of the brand new family-ship, the P&O Iona who will offer weekly cruises to the Norwegian Fjords out of Southampton. A yet-to-be-named sister-ship to Iona will be launched in 2022. P&O offer a variety of itineraries out of Southampton to the Norwegian Fjords, Baltics, Canary Islands, British Isles, Iberia, Western & Central Mediterranean and short Cruise-Breaks to Belgium, the Netherlands, France & Guernsey.